the governing equations for flow through an urban canopy (e.g., ... the simulation of the mean wind speed and turbulence for a neutrally stratified flow through. 2Research Student, Department of Marine Engineering, National Kaohsiung Marine University, No. .... gravity blind duct which is enhanced by twisted tape insert. Nov 19, 2014 - â Email address for correspondence: [email protected] Page 2. 242. G. Daschiel, V. Krieger, J. JovanoviÄ and A. Delgado. 0.02. 0.04. Jan 12, 2012 - and cons of each modeling methods will be given at the end of this paper. Nomenclature. H. = distance from jet exit to the ground plate. D(Djet). ... Rhine region of freshwater influence. Elisabeth Fischer Â· Hans Burchard Â· ... points northeastward and ranges between 3 and 8 cm/s (van Alphen et al. 1988). One example of an important problem is the exhaust gas from jet engines ...... Aerospace Science Meeting and Exhibit, Reno Nevada, 2006. . Johnson, A. NUMERICAL AND PHYSICAL MODELING. OF TURBULENT FLOW IN A DIVERGENT. CHANNEL WITH A VORTEX CELL. S. A. Isaev, a. P. A. Baranov, a.
IRACST â Engineering Science and Technology: An International Journal (ESTIJ), ISSN: 2250-3498 .... The mathematical model of the transport process of mud flow .....  N.J. Alderman, D. Ram Babu, T.L. Hughes and G.C. Maitland, âThe. example in Hammerfest, Norway a 350 kW prototype is ready to be connected to the grid. Marine Current. Turbines Ltd has also recently launched a 300kW tidal. 54, Newton Road, Mumbles, Swansea, U.K.. ISBN 0-906674-,77-8. Copyright Â© 1991 Pineridge Press. British Library Cataloguing in Publication Data. high as 37.5oC during a sunny afternoon when the water flow rate is 0.15 kg/s. This water temperature is comfortable for use in showers with no auxiliary. Cover: The H¨olleforsen Kaplan turbine model geometry. Excluded in the picture are the stay vanes, parts of the spiral casing and parts of the runner shroud. of the GAMM Francis runner are validated against measurements at both the best efficiency operating condition and four off-design operating conditions. Several important flow features are visualized to make comparisons with experimental observations and to better understand the flow in water turbine runners. The validations against both detailed measurements and experimental observations show that the flow is captured qualitatively correctly. A method for numerical verification of the computational results has been derived and applied to the computational results of the present work. The method is based on the conservation of a sub-set of the angular momentum equations that is particularly important to swirling flow in water turbines. The method is based on the fact that the discretized angular momentum equations are not necessarily conserved when the discretized linear momentum equations are solved. The method shows that the first-order hybrid discretization scheme cannot be used and that the second-order Van Leer discretization scheme needs improvement to give quantitatively correct results in these kinds of applications. V. H. Nilsson and L. Davidson ”A Numerical Investigation of the Flow in the Wicket Gate and Runner of the H¨olleforsen (Turbine 99) Kaplan Turbine Model” ¨ In Proceedings of Turbine 99 - II, Alvkarleby, Sweden, 2001. VI. 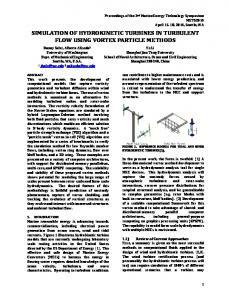 H. Nilsson and L. Davidson ”Validations of Finite Volume CFD Against Detailed Velocity and Pressure Measurements in Water Turbine Runner Flow” Submitted for journal publication, 2002. VII. H. Nilsson and L. Davidson ”Application of a Momentum-Imbalance Method for Investigating Numerical Accuracy in Swirling Flow” Submitted for journal publication, 2002. VIII. H. Nilsson and L. Davidson ”Validations and Investigations of the Computed Flow in the GAMM Francis Runner and the H¨olleforsen Kaplan Runner” Accepted for publication in the Proceedings of 21:st IAHR Symposium, Lausanne, Switzerland, 2002. Pic in Montreal, Canada, for virtual reality visualization; Chalmers Medialab for virtual reality visualization; UNICC for computational resources and MDC for computer support. I would like to thank the following people who have contributed to this work in one way or another: Simon Dahlstr¨om, who made many ˚ of the speed-up tests in Paper II; Anders Alund, who helped me use PVM during the early stages of the implementation of the code; Janet Vesterlund, who is one of the few people that have read every word I have written – thank you for proofreading my papers! Sandra, Ulla and Monika – you’re doing a great job! The rest of the people at the Department – I don’t need to remind you of the nice atmosphere we have. I would like to end this acknowledgement by mentioning some people that have had a great influence on my life: The surfers of Falkenberg – you are the true experts in practical fluid dynamics. Surfing is actually the reason that I ended up here and I will always be a surfer. Hang loose! My parents, Eva and Bengt, who have done (and still do) everything for me, my brother and our families. I hope that I will be as good a parent. My brother and his family, Anders, Camilla, Felicia and Hanna – you mean a lot to me. My wife Maria and our daughter Emmy – the meaning of life – I love you both! .............................................................. and you are gratefully acknowledged. 1 Introduction 1.1 Introduction to water turbines . . . . . . . . . . 1.1.1 Water turbine runners . . . . . . . . . . 1.1.2 The reaction turbine working process . 1.1.3 Flow features in water turbine runners 1.2 A short description of the work . . . . . . . . . 1.2.1 The first Kaplan runner . . . . . . . . . 1.2.2 The GAMM Francis runner . . . . . . . 1.2.3 The H¨olleforsen Kaplan runner . . . . .
2 Summary of the papers 2.1 Paper I . . . . . . . . 2.2 Paper II . . . . . . . . 2.3 Paper III . . . . . . . 2.4 Paper IV . . . . . . . 2.5 Paper V . . . . . . . . 2.6 Paper VI . . . . . . . 2.7 Paper VII . . . . . . . 2.8 Paper VIII . . . . . .
3.4 Comparisons at section Ia . . . . . . . . . . . . . . . . . . 3.5 Comments to the phase resolved comparisons . . . . . . . . . . . . . . . . . . . . . . . . . .
4 Unsteady computations of the Holleforsen ¨ runner flow 4.1 The unsteady inlet boundary condition . . . . . . . . . . . 4.2 Preliminary results . . . . . . . . . . . . . . . . . . . . . . 4.3 Discussion . . . . . . . . . . . . . . . . . . . . . . . . . . .
A Governing equations A.1 Continuity and momentum equations . . . . . . . . . . . A.2 Turbulence modelling . . . . . . . . . . . . . . . . . . . . . A.3 Summary of the solved equations . . . . . . . . . . . . . .
B The code B.1 The finite volume method . . . . . . . . B.2 Spatial discretization schemes . . . . . . B.2.1 The central scheme . . . . . . . . B.2.2 The first-order upwind scheme . B.2.3 The hybrid scheme . . . . . . . . B.2.4 The Van Leer Scheme . . . . . . . B.3 Pressure-velocity coupling . . . . . . . . B.3.1 The SIMPLEC method . . . . . . B.3.2 Rhie & Chow interpolation . . . . B.4 Boundary conditions . . . . . . . . . . . B.4.1 Walls . . . . . . . . . . . . . . . . B.4.2 Inlet/outlet conditions . . . . . . B.4.3 Periodic boundaries . . . . . . . . B.5 Solving the discretized equations . . . . B.6 Convergence criteria . . . . . . . . . . . B.7 The parallel multiblock implementation B.7.1 Numerical procedure . . . . . . . Figure 1.1: Schematic description of a power plant and definitions of some important terms. reduce the manufacturing cost. Investigations of the computational results can also be used to further understand the details of the flow in water turbine runners. The following sections introduce the area of water turbines, report on the numerical investigation approach used in this work and give a description of the cases studied. Chapter 1: Introduction from the turbine into the tailwater. The total losses also include nonhydraulic losses such as power transmission through the turbine shaft and electricity generation in the generator. To further investigate the turbine working process we need to know more about the working parts of the water turbine, which is discussed in the next sections. Figure 1.2: A Kaplan water turbine. Parts of the casing are removed in the illustration in order to show the interior parts. Picture courtesy of GE Energy (Sweden) AB. Figure 1.3: A Francis water turbine. Parts of the casing are removed in the illustration in order to show the interior parts. Picture courtesy of GE Energy (Sweden) AB. Chapter 1: Introduction and influence the runner inlet swirl. Francis turbine runners consist of 12 to 17 blades that are fixed rigidly in the crown and the band to attain the required strength and rigidity. There are thus no tip clearances in Francis runners. After the runner the water flows axially into a straight diffusor, which recovers some of the remaining kinetic energy. Excluded in this picture is the draft tube (see figure 1.1), which is a diffusor that recovers more of the remaining kinetic energy and leads the water to the tailwater. Pshaft = hQgH where h [;] is the hydraulic efficiency. As the water flows through the wicket gate and the runner the static pressure is reduced. The static pressure may actually be reduced below atmospheric pressure and at some operating conditions may be locally reduced to a level where the water cavitates. As the water flows through the diffusing draft tube into the tailwater the kinetic energy is reduced and some of the static pressure is recovered. Studying the flow in the draft tube however is beyond the scope of this work. Figure 1.6: Hub and tip clearance cavitation. The picture shows the suction side of a Kaplan runner blade. The leading edge is at the upper left and the trailing edge is at the lower right. The hub is to the left. The cloudy structure close to the hub and the streaky structure close to the blade tip are cavitation bubbles that have developed in low static pressure regions. Picture courtesy of M.Grekula and G.Bark, Department of Naval Architecture and Ocean Engineering, Division of Hydromechanics, Chalmers University of Technology. Figure 1.7: Comparison between the lowest predicted static pressure region (dark grey iso-surface) and observed cavitational behavior at the best efficiency operating condition of the H¨olleforsen Kaplan runner. The cavitational behavior was observed in 1955 at a model test of a very similar runner at roughly the same operating conditions as the computations (Picture courtesy of GE Energy (Sweden) AB). the runner blades are very expensive. The present work studies noncavitating (single phase) flow, which means that cavitation is not included in the computations. Some indications on the cavitational behavior of the flow in the runner may however be visualized as regions of low static pressure. Figure 1.7 compares predicted and experimentally observed low static pressure regions and cavitational behavior of the H¨olleforsen Kaplan runner. The discussion of cavitation highlights the necessity of capturing the details of the flow in water turbines. Figure 1.8: The first Kaplan runner geometry, meridional contour (solid lines) and the domains computed (dashed lines). The left domain is the guide vane domain, with a radial inlet outside the guide vanes and an axial outlet below the runner. The right domain is the runner domain, with a radial inlet at the trailing edge of the guide vanes and an axial outlet at the lower part of the figure. Note that the runner blades are not included in the guide vane computations and the guide vanes are not included in the runner computations. applications. The following sections describe the three different water turbine runners (two Kaplan runners and one Francis runner) investigated in the present work. Chapter 1: Introduction runner blade angle is the same for all the operating conditions so that it was possible to use the same grid in all the cases. The chosen runner blade angle gave a constant tip clearance width from the runner blade leading to trailing edges. This runner was used during the development of the code. It was found that the runner blade angle made it very difficult to generate a good grid that resolved both the boundary layers and the tip clearance with the ICEM CFD grid generation features available at that time. It was also found that the constant and very small width of the tip clearance gave a very small tip vortex that was difficult to observe. A major drawback of this runner is that there are no detailed measurements of the flow. The only information available on this runner is the geometry, the guide vane angle, the runner blade angle, the volume flow, the head, the efficiency, the torque and some general observations made by the turbine manufacturer. It could thus not be used to validate the details of the computational results. The first computations for this runner were presented in a Licentiate thesis  and at the Hydropower Into the Next Century conference . These computations assumed an axisymmetric fully developed turbulent 1=7 profile at the trailing edges of the guide vanes. The flow angle was assumed in this case to be aligned with the guide vanes. The flow equations were discretized with the first-order hybrid scheme, which was stable enough to give a solution. Subsequent computations have used the circumferentially averaged results of separate guide vane computations as inlet boundary conditions and the secondorder Van Leer discretization scheme (see Paper I). All computations assumed the flow to be steady and periodic over a single blade. No validations against measurements could be made but the work on this runner highlighted the importance of using a higher-order discretization scheme when computing the flow in water turbine runners (see Paper VII). ˚ Hakan Nilsson, Numerical Investigations of Water Turbine Flow nique F´ed´erale de Lausanne) for experimental research in the LMH (Laboratoire de Machines Hydrauliques) hydraulic laboratory. The model was used as a test case at the 1989 GAMM workshop, where all the geometrical information, including stay vanes, guide vanes, runner and draft tube, and the best efficiency measurements were available. The GAMM runner is also used as a test case in the annual ERCOFTAC (European Research Community On Flow Turbulence And Combustion) Seminar and Workshop on Turbomachinery Flow Predictions. Of course, several off-design operating condition measurements have been made at IMHEF for internal use. Some of these measurements, namely the best efficiency operating condition and four off-design operating conditions, are used in this work. Figure 1.9 describes the GAMM runner geometry, the measurement sections and the computational domain. The GAMM runner has 13 blades with a runner diameter of 0:4m. The present work computes the steady periodic flow of a single runner blade. The computational domain starts at the guide vanes, where inlet boundary conditions derived from an extrapolation of the measurements before the runner blades are applied. The guide vanes are not included in the present work and the computational domain ends at the end of the axi-symmetric diffusor, before the draft tube bend. The present work compares the computational results of the GAMM runner with measurements of the circumferentially averaged velocity and static pressure distributions, the runner blade static pressure distributions, the torque, the specific energy and the efficiency (see Paper III). The comparisons show that the code predicts the flow in the GAMM runner well and that the parallel multiblock CALC-PMB CFD code can be relied upon to predict the turbulent flow in hydraulic machinery. Figure 1.9: The GAMM Francis runner geometry, meridional contour (solid lines) and the domain computed (dashed lines). The domain has a radial inlet at the top and an axial outlet at the lower part of the figure. The dotted lines are sections in which the results are compared with measurements. Note that the inlet boundary conditions are extrapolated from the measured inlet axis to the inlet of the computational domain. Chapter 1: Introduction (Sweden) AB H¨olleforsen runner manufacturer was one of the collaborative partners in the work. Most of the measurements and the computations were made at a head of H = 4:5m, a runner speed of N = 595rpm and a volume flow of Q = 0:522m3 =s. This operating condition is close to the best efficiency operating point at 60% load and was referred to as test case T (top point of the propeller curve) at the Turbine 99 workshop. The present work numerically studies the flow in the H¨olleforsen model wicket gate and runner and compares the computational results to the Turbine 99 measurements (see Paper V). The computations are also compared with LDV measurements of the wicket gate flow made as part of this work (see Paper IV). The computations capture most of the measured and observed flow features in the vicinity of the runner. The computational results thus supplement the experimental results and add to the knowledge of the flow in the H¨olleforsen Kaplan model. Chapter 2 Summary of the papers This chapter summarizes the attached papers, conference contributions and internal reports, which cover most of the aspects of the present work. The papers are numbered in chronological order. Further work not included in the attached papers is reported in Chapters 3 and 4. 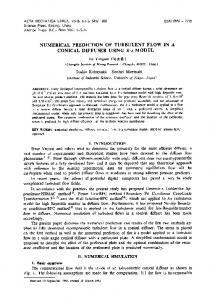 This paper “Parallel Multiblock CFD Computations Applied to Industrial Cases”, was presented at the Parallel Computational Fluid Dynamics - Trends and Applications conference in Trondheim, Norway, in 2000. The work discusses some parallelization aspects of the CALCPMB CFD code that was developed in the present work. The parallel efficiency and the load balance issues are discussed for computations of both water turbine runners, a high-lift airfoil  and an academic test case. The tests were made on two different super computer architectures. It is shown that the parallel efficiency is excellent, with super scalar speed-up for load balanced applications using the best configuration of computer architecture and message passing interface. For water turbine runner computations, however, it is shown that it is difficult to obtain load balanced computations with the present approach, and the parallel efficiency may drop rapidly. It is discussed that the load balance problem can be handled by a re-distribution of the multiblock topology or by time sharing of small blocks on shared CPUs. A comparison of load balanced airfoil computations using two different computer architectures and different message passing interfaces shows that a poor combination of computer architecture and message passing interface may drastically reduce the parallel efficiency. In contrast, with a good combination of computer architecture and message passing interface, it is shown that the parallel approach is super scalar up to 32 processors for large load balanced industrial CFD problems. Chapter 2: Summary of the papers countered in making the validation, such as discrepancies in the geometrical information and problems with the experimental data. The paper compares the computational results of the GAMM runner with measurements of the circumferentially averaged velocity and static pressure distributions, the runner blade static pressure distributions, the torque, the specific energy and the efficiency. The comparisons show that the code predicts the flow in the GAMM runner well. This is particularly true at the best efficiency operating condition. At off-design operating conditions both the measurement technique and the computational technique are inadequate at the measured outlet axis below the runner. This region is characterized by a strong flow unsteadiness, recirculation and non-periodicity. For the comparisons away from this region the computational results and the measurements agree well. Some predicted flow features are visualized to highlight results that correspond to experimental observations, such as recirculation and cavitation. Experience gained in the computations shows that almost all the convergence problems in all computations have their origin in the flow beneath the hub. It is found that the tangential velocity converges extremely slowly close to the axis of rotation in this region. A proposal for further study of the unsteady non-periodic flow in the diffusor after the runner is made. The paper concludes that the parallel multiblock CALC-PMB CFD code can be relied upon to predict the turbulent flow in hydraulic machinery. ˚ Hakan Nilsson, Numerical Investigations of Water Turbine Flow workshops on draft tube flow, where detailed LDV and pressure measurements were made after the runner. The goal of the present work was to increase knowledge of the flow before the runner and to validate computations of the flow in the spiral casing and distributor. The measurement sampling rates and times and the spatial resolution were sufficient to get a detailed picture of the mean flow and RMS (Root Mean Square) values in three measurement planes. The measurement planes covered much of the spiral casing and distributor ducts and extended into the trailing edges of the guide vanes. A runner phase signal that correlates the measurement samples with the runner orientation was used to study the influence of the runner blade passages. No such effect could be observed, however, since it was much smaller than the effect from the turbulent fluctuations. This result shows that the velocity distribution in the guide vane passage is not significantly influenced by the runner blade passage and that the flow in the guide vane passage can be computed separately. The measurements revealed a local increase in the magnitude of the radial velocity in the boundary layer at the top of the spiral casing. This behavior has been observed before, both experimentally and numerically, in the flow closer to the runner. It was thus very interesting to find the same behavior as early as in the spiral casing. The effect is related to a reduction of the centrifugal force in the boundary layer. A numerical prediction of the flow in the H¨olleforsen guide vane passage is compared with the experimental results. It is shown that the prediction captures the main flow features between the guide vanes and that the separate guide vane computations can be used to generate inlet boundary conditions for computations of the H¨olleforsen Kaplan runner. ˚ Hakan Nilsson, Numerical Investigations of Water Turbine Flow part of the diffusor after the runner, which corresponds well with the measurements. This study showed that the wall pressure significantly differs from the cross-sectional averaged pressure owing to the swirling motion of the flow in the axial diffusor. Chapter 2: Summary of the papers The investigations of the H¨olleforsen flow show that the runner blade wakes and the pressure recovery in the axial diffusor are qualitatively captured by the computations. ˚ Hakan Nilsson, Numerical Investigations of Water Turbine Flow The paper presents through-flow investigations of the angular momentum balance error in computations of two Kaplan water turbine runners and a simplified geometry of one of the Kaplan runner ducts. The through-flow investigations are generated by computing the balance error between the inlet and a downstream cross-flow surface that is moved from the inlet to the outlet. The result of this operation shows the balance error distribution in the through-flow direction. The balance error is also investigated as global (all of the computational domain) and local (each computational control volume) error estimators. The paper shows that the first-order hybrid discretization scheme cannot be used for computations of water turbine runner flow. The global angular momentum balance errors for the hybrid discretization scheme are 14% and 15% for the Kaplan runners. The corresponding errors for the second-order Van Leer scheme are 0:5% and 0:7%. The global imbalances of the hybrid scheme are thus about 30 times larger than for the Van Leer scheme. It may seem that a 0:7% angular momentum balance error for the Van Leer scheme is rather good, but there are at least two reasons why the error should be reduced: 1) the linear momentum is better predicted; 2) water turbine efficiencies are very high (about 95%) and the improvements that can be made are in the range of 0:1% in efficiency. Since the efficiency is closely related to the angular momentum balance it is interesting to further investigate the angular momentum balance for the Van Leer scheme. Chapter 2: Summary of the papers the best efficiency operating condition and a reduced runner speed operating condition. When the runner speed is decreased the load of the runner blades increases and the tip clearance flow increases. The computed flow through the 0:4mm-wide tip clearances of the H¨olleforsen runner model is 5:45  10;3 m3 =s for the best efficiency operating condition, and 1:69  10;2 m3 =s for the low unit speed case (all five runner blades). This corresponds to 1:0% of the total volume flow for the best efficiency operating condition and 3:2% of the total volume flow for the low unit speed case. The tip clearance flow gives rise to a jet on the suction side of the runner blade that interacts with the shroud boundary layer and forms a vortex. Visualization of the flow in the tip vortex shows that it is small for the best efficiency operating condition but is very large for the low unit speed case. The vortex core is close to the runner blade tip at the best efficiency operating condition but is further away from the tip in the low unit speed case. The computed regions of low static pressure are compared to experimentally observed cavitational behavior for a similar runner at roughly the same operating conditions as the computations. In particular the best efficiency predictions agree with the cavitational behavior. The low unit speed experimental observation shows that the tip vortex cavitation starts earlier than at the best efficiency operating condition and that there is a leading edge cavity. This is qualitatively captured by the computations. It should be noted however that the computations are single phase computations that do not take cavitational effects into account. The paper investigates the use of surface restricted streamlines (smearlines) to visualize flow features in water turbine runners. Some known computed flow features were easily visualized and numerous new computed flow features were discovered, e.g. separation, re-circulation, reattachment and stagnation. Once the new flow features were discovered they were easily investigated using ordinary streamlines. A combination of both kinds of visualizations gives the best understanding of how the flow behaves. Chapter 3 Further investigations of the ¨ Holleforsen runner flow This chapter further investigates the flow at section Ia of test case T of the H¨olleforsen model (see Section 1.2.3). The comparisons are thus made at a head of H = 4:5m, a runner speed of N = 595rpm and a volume flow rate of Q = 0:522m3 =s. The computational results are compared both to experimental mean values and phase resolved values at section Ia. The following sections describe the measurement techniques, the computational technique and how to compare the experimental and numerical results. ˚ Hakan Nilsson, Numerical Investigations of Water Turbine Flow a point that is steady in an inertial coordinate system, it is the absolute (inertial) velocities that are measured. Figure 3.1 shows that the measurements were made at two locations, which was done in order to study the tangential variation. Measurement sections Ia(1) and Ia(2) are located at approximately opposite sides of the draft tube cone (section Ia(1) is the same as the official section Ia). Two kinds of velocity measurements at section Ia were presented at the workshops. These are described below. Hub (0) to shroud (1) Figure 3.2: Comparison of three velocity measurements at section Ia. Solid lines with error bars: official measurements Ia/Ia(1); dashed lines: Ia(2); dotted lines: tangential average of phase resolved measurements. Measurement markers: : tangential; : meridional. 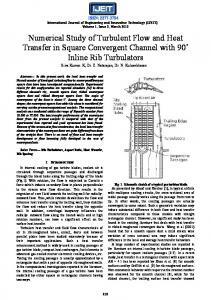 Hub (0) to shroud (1) (b) Tangential component. Figure 3.3: Comparison between the three RMS measurements at section Ia. Solid lines with error bars: official measurements Ia/Ia(1); dashed lines: Ia(2); dotted lines: tangential average of phase resolved measurements. where xi is an individual measurement sample, i is the corresponding weight factor (set to i = 1 in all the measurements) and N is the number of measurement samples at each tangential angle (phase compartment), r  r =2, relative to the runner. xi=1:N is thus a collection of all the samples of a single instantaneous velocity component from one measurement period that were made at a single radius and a single phase compartment, r  r =2, at section Ia(1). For each radius the measurements thus give X (r ), which is the phase-average of the velocity component at r  r =2, and x0 (r ), which is its corresponding phase averaged RMS value. Both X (r ) and x0 (r ) thus resolve the runner blade wakes if r is sufficiently small. On the other hand, r must also be large enough to contain a sufficient number of measurement samples. r = 2 gives the same kinds of measurements as were made for the first workshop. Since the variation between the flow after each runner blade was negligible the measurements samples from all blade passages were averaged relative to a single blade passage, which increased the number of samples in each r five times (five runner blades). The results were then copied periodically for the visualization. These experimental results are shown below in comparison with the computational results. Figure 3.4: ...continued. The three grids used to compare the grid dependency on the prediction of the flow at section Ia. The main differences between the grids are the grid density and the grid distribution between the runner blades and section Ia. Grid 1 and grid 2 include the hub clearance, which is not included in grid 3. Note that the flow in only one blade passage is computed, employing periodic boundary conditions. Chapter 3: Further investigations of the H¨olleforsen runner flow The computational results basically give the three relative Cartesian velocity components, the static pressure, the turbulent kinetic energy (k = 1=2ui ui ) and the specific dissipation (! ), at the center of all the computational control volumes. Hub (0) to shroud (1) Figure 3.5: Comparison between computed and measured velocity coefficient distributions at section Ia. Solid lines: grid 1; dashed lines: grid 2; dashed-dotted lines: grid 3. Measurement markers: : tangential; : meridional. Time ( s ) (b) Zoom of the first runner blade passage. Figure 3.6: Comparison between computed and measured periodic behavior of the tangential velocity component at r = r=R = 0:92 at section Ia. Dots: individual measurement samples; dashed line: grid 1; thick solid line: grid 2; thin solid line: grid 3. The computational results have been phase-shifted to match the measurements because it was not possible to obtain the exact runner angles of the measurements. One runner revolution (five blades passages) takes approximately 0.1s. Figure 3.7: Comparison between the computational results and the original measurements at section Ia with respect to turbulence intensity. Dashed lines: grid 2; solid lines: grid 3. Measurement markers: : axial; : tangential. (a) Computed tangential velocity, grid 2. (b) Computed tangential velocity, grid 3. Figure 3.8: Comparison between the computed tangential velocity and the phase resolved measurements at section Ia. The equidistance is 0:1m=s and the color scale is the same for the measurements and the computations. (a) Computed axial velocity, grid 2. (b) Computed axial velocity, grid 3. Figure 3.9: Comparison between the computed axial velocity and the phase resolved measurements at section Ia. The equidistance is 0:1m=s and the color scale is the same for the measurements and the computations. Chapter 3: Further investigations of the H¨olleforsen runner flow sumption predicts a non-negligible anisotropic turbulence although the k ; ! turbulence model is based on the assumption of isotropic turbulence. As for the velocities, the measured RMS values closest to the hub are disturbed by light reflections, which makes them questionable. On the other hand, it is also particularly difficult to predict the flow close to the hub as already mentioned. It should be noted that grid 3 does not include the hub clearance, which would increase the turbulence level close to the hub. This cannot be seen in the results from grid 2, since that wake is too smeared out, but it has been observed in preliminary computations with a grid similar to grid 3 but which included the hub clearance. Figure 3.12 shows that the overall pattern of the RMS distributions can be found in the computed turbulent kinetic energy from the kequation. The tip vortices thus contain high turbulent kinetic energy, which contributes to a reduction of the efficiency of the machine. (a) Computed tangential RMS, grid 2. (b) Computed tangential RMS, grid 3. Figure 3.10: Comparison between the computed RMS of the tangential velocity component and the phase resolved measurements at section Ia. The equidistance is 0:05m=s and the color scale is the same for the measurements and the computations. (a) Computed axial RMS, grid 2. (b) Computed axial RMS, grid 3. Figure 3.11: Comparison between the computed RMS of the axial velocity component and the phase resolved measurements at section Ia. The equidistance is 0:05m=s and the color scale is the same for the measurements and the computations. (a) Computed turbulent kinetic energy, grid 2. (b) Computed turbulent kinetic energy, grid 3. Figure 3.12: Comparison between the computational results at section Ia with respect to turbulent kinetic energy. Thick solid lines mark the location of the wake (the maximum tangential velocity for each radius). The equidistance is 0:0025m2 =s2 and the color scale is the same for both grids. Note that the computational results are copied periodically for the visualization. Chapter 3: Further investigations of the H¨olleforsen runner flow tions must include unsteady effects. Neither of these requirements is accounted for in state of the art water turbine computations because of the unreasonable demand for computational power and the need of quick engineering results. The rapid development of computational power is however promising with respect to more detailed and accurate numerical computations of the flow in water turbines. Higher-order discretization schemes would be another way to increase the accuracy of the computations. Unfortunately, by increasing the order of the discretization scheme, the numerical convergence problems also increase drastically. The solution to this problem has yet to be found. ˚ Hakan Nilsson, Numerical Investigations of Water Turbine Flow scheme is slightly more implicit than the true second order CrankNicolson scheme, where  = 0:5. The time step is 8  10;6 s to obtain sufficiently small CFL numbers. Chapter 4: Unsteady computations of the H¨olleforsen runner flow together with the runner rotation, , to determine the rotation of the inlet boundary condition. The periodic time variable starts at zero, adds each time step and restarts at zero when it reaches 2= . The reason for this is to avoid cancellation when adding small time steps to large times, which would stop the time propagation. Figure 4.1 shows the runner inlet distribution of the tangential velocity at a single time step. Since the runner is computed in a rotating coordinate system and the distributor results belong to an inertial coordinate system, this boundary condition is rotated opposite to the runner rotation with the same rotational speed as the runner. The runner inlet boundary condition is thus close to axi-symmetric in the upper part and periodic in the lower part. It is however questionable whether the guide vane wakes are properly resolved, since the flow after the guide vanes goes diagonally through the control volumes, which introduces numerical diffusion that smears out the wakes. The wakes are best resolved in the lower part of the inlet, where the control volumes are smallest and the distance between the guide vanes and the inlet of the runner computational domain is smallest. The flow in the upper part between the guide vanes and the runner inlet goes through larger control volumes and, because of conservation of angular momentum, also goes through a larger number of control volumes, which smears out the wakes. The wakes are most likely smeared out in the experimental set-up as well, but the visual access of the model does not allow measurements in this region . The purpose of this work is to study the unsteady effect of the guide vane wakes on the tip vortex flow, and the flow in the tip vortex has its origin in the lower part of the runner inlet, where the wakes are best resolved. The present inlet boundary condition is therefore considered sufficient for preliminary studies of unsteady computations of the runner flow. Figure 4.2: Instantaneous plot of the tangential distribution of the absolute tangential velocity at 5% of the channel width from the shroud (at radius r = rmax ; 0:05(rmax ; rmin )). Thin curve: runner inlet; thick curve: half way between the inlet and the runner blade tip, from the runner computation; dashed curve: half way between the inlet and the runner blade tip, from the guide vane computation. The angle is in radians relative to the runner and increases in the runner rotational direction. Note that the curves have separate angle origins. Two periodic runner blade passages (2  2=5) and the corresponding ten guide vane passages are shown. It is shown in this chapter that the runner URANS computational result gives an unsteady solution, but it is only weakly unsteady. The reason for this is believed to originate in insufficiently resolved guide vane wakes and too much numerical and turbulent diffusion, which has also been observed at the runner blade wakes. Since the guide vane wakes are moving relative to the runner coordinate system, the wakes must be resolved everywhere, which is impossible with the available computational power. In large parts of the domain the flow goes diagonally through the computational control volumes, which introduces numerical diffusion that smears out the wakes too much. The flow that reaches the runner blades is more or less sinusoidal, with too small an amplitude. The gradients are thus not sharp enough to produce flow instabilities with the present stable Van-Leer upwind discretization scheme. Another reason for the lack of unsteady effects in the tip vortex is that the leakage vortices caused by leakage flow from the pressure side to the suction side at the guide vane overhang are not included in the distributor computations. Grekula  shows that vortex interaction is a major source of waviness in vortex core shapes, which suggests that the guide vane overhang leakage flow is important with respect to the dynamics of the tip vortex. The unsteady behavior of the tip vortex might also be enhanced by cavitational dynamics, since it is more or less always observed in cavitating conditions. The present computation does however not include cavitation. Chapter 5: Conclusion of heat transfer in gas turbines. A numerical verification method based on the conservation of a subset of the angular momentum equations has been developed. The method is both a local and global error estimation method, and it may be used to show the error development along the numerical flow path. The verifications made in the present work show that the first-order hybrid discretization scheme cannot be used in computations of the flow in water turbine runners and that the second-order Van Leer discretization scheme needs improvements to give quantitatively good results. The global error of the hybrid scheme is shown to be about 30 times larger than for the Van Leer scheme. The Van Leer scheme has a global error between 0:5% and 3% for the cases computed in the present work. The present work has studied only a small part of the angular momentum balance that is important to a single vortex with known features. There are, however, several vortices of unknown features in turbomachinery flow (and most other flows as well) that must also be resolved. It is obvious that a discretization scheme that simultaneously preserves both the linear momentum equations and the general angular momentum equations is desirable. A final conclusion that can be made from the present work is that neither the theoretical methods, the experimental methods nor the numerical methods of today are sufficient to fully describe the turbulent flow in water turbines. However, a combination of several methods gives quite a detailed picture of what is really going on in water turbine flow. BIBLIOGRAPHY  S.V. Patankar. Numerical Heat Transfer and Fluid Flow. McGrawHill, New York, 1980. W. H. Press, S. A. Teukolsky, W. T. Vetterling, and B. P. Flannery. Numerical Recipes in FORTRAN. CAMBRIDGE UNIVERSITY PRESS, Cambridge, second edition, 1995. A. Sveningsson. Private communication. Dept. 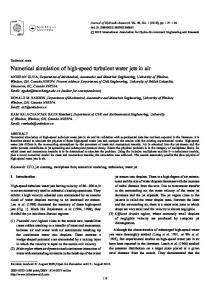 of Thermo and Fluid Dynamics, Chalmers University of Technology, 2002. B. van Leer. Towards the ultimate conservative difference scheme. Monotonicity and conservation combined in a second order scheme. Journal of Computational Physics, 14:361–370, 1974. H.K. Versteeg and W. Malalasekera. An introduction to Computational Fluid Dynamics The Finite Volume Method. Addison Wesley Longman Limited, Essex, England, 1995. D.C. Wilcox. Reassessment of the scale-determining equation for advanced turbulence models. AIAA J., 26(11):1299–1310, 1988. Appendix A Governing equations This appendix describes the governing equations for turbulent flow in a rotating coordinate system. Appendix A.1 presents the continuity and momentum equations that fully describe the flow. Appendix A.2 presents the turbulence closure model used in the present work. p = p ; gixi + ijk klm j l xm xi In post-processing, the variation of the gravity term is assumed to be negligible and the centripetal term is simply subtracted from the reduced pressure to get the static pressure.
? = 0:09, c!1 = 59 , c!2 = 403 , k = 2 and ! = 2 The two-equation model described above is the k ; ! model by Wilcox . The main advantage of this model is that it gives good results throughout the boundary layer without complicated correction functions on the basis of distance to the wall. It is a simple turbulence model that enhances computational stability. Appendix B The code A parallel multiblock finite volume code, CALC-PMB (Parallel MultiBlock), for computations of the turbulent flow in complex geometries was developed. The main features of the code are the use of conformal block structured boundary fitted coordinates, a pressure correction scheme (SIMPLEC, appendix B.3.1), Cartesian velocity components as principal unknowns and collocated grid arrangement together with Rhie and Chow interpolation (appendix B.3.2). The governing equations (appendix A) of fluid flow in a rotating coordinate system are discretized using a finite volume method (appendix B.1). The turbulence is modeled using a low-Reynolds k ; ! turbulence model (appendix A). For grid generation, an interface to the commercial grid generator ICEM CFD/CAE was implemented. In the parallel multiblock algorithm, two ghost cell planes are employed at the block interfaces (Appendix B.7). The message passing at the interfaces is done using either PVM (Parallel Virtual Machine) or MPI (Message Passing Interface). The code may be run in parallel on everything from heterogeneous networks of workstations to Linux clusters and distributed and shared memory supercomputers. The gains of the parallel implementation are several: the computational speed may be increased, larger problems may be solved since the memory requirement is divided between the processors and more exact solutions may be obtained because of the extra memory available. Figure B.1: The division of the domain into a finite number of control volumes. Two-dimensional example. The nodes are placed in the center of the control volumes except at the boundaries, where they are placed at the boundary. At the center control volume (dashed line), the nomenclatures for control volumes (nodes ( P, E, W, N, S) and faces ( e, w, n, s)) are introduced. To solve the discretized transport equation, B.5, the total fluxes (equation B.2) through the faces of the control volume must be known. Since all variables are calculated at the nodes, some kind of interpolation must be used to get the fluxes through the control volume faces. A number of ways of doing this are described in the literature. Some of the discretization schemes included in the code are described in the following sections. All schemes are presented for the east face (e) but the rest of the faces have similar expressions. trol volume faces, denoted according to figure B.1. For uniform grids, fe = 0:5. The diffusion is also discretized using central differencing. Two major drawbacks of the central scheme are that it is unbounded, which can lead to unphysical oscillations and numerical problems, and that it is unable to identify flow direction. In a strongly convective flow, the face values should be influenced more by the upstream node than by the downstream node. This scheme is a combination of the central and the first-order upwind schemes. It uses the central scheme if the magnitude of the Peclet number is below two and the first-order upwind scheme otherwise. where Fe is the convective mass flux per unit area and De is the diffusion conductance at cell faces. The diffusion is discretized using central differencing for jPeej < 2 and is otherwise neglected. The hybrid scheme thus uses the first-order upwind scheme if convection is dominant and the central scheme if diffusion is not negligible. The major drawback of the hybrid scheme is that convection is dominant in most flows and the hybrid scheme can be regarded as a first-order upwind scheme. The Reynolds averaged Navier Stokes equations for incompressible flow depend on the pressure distribution, which must be solved together with the velocities. Since there is no equation for the pressure for incompressible flow, some kind of pressure-velocity coupling is needed. The pressure-velocity coupling used in this code is called SIMPLEC and is described in the following section. aP = aE + aW + aN + aS + aH + aL 2 e aE = e au ;AP aunb e .. . This pressure correction equation is solved using aunb and ui nb values (on the scalar control volume faces) from the momentum equations. Since this code utilises a collocated grid arrangement, the aunb values are obtained from linear interpolation of the auP values and the uinb values are obtained from Rhie & Chow interpolation (described in appendix B.3.2) of the uiP values. The new pressure field may then be obtained from eq. B.6, and the new convections (through the scalar control volume faces) and the node velocities are corrected according to eqs. B.8 and B.9. Since this code utilises a collocated grid arrangement, the convections through the faces needed for the pressure correction equation are obtained from Rhie & Chow interpolation, described below. The face velocity is usually obtained by linear interpolation, i.e. control volume faces, denoted according to figure B.1. In a collocated grid arrangement, however, this may lead to pressure oscillations. To avoid this, the face velocities are calculated by subtracting and adding the pressure gradient, i.e. The pressure correction, p0 , has an implicit homogenous Neumann boundary condition on all boundaries , i.e. @p0 = 0 @n where n is the coordinate direction normal to the boundary. An inhomogenous Neumann boundary condition is used to obtain the pressure at all boundaries, i.e. @2P = 0 @n2 where n is the coordinate direction normal to the boundary. Boundary conditions for the velocities and other variables are described in the following sections.  y t = lnu(Ey +) Wall functions are less time consuming than low-Reynolds number wall treatment since the boundary layer is not resolved, but more of the physics is approximated. Appendix B: The code At a large outlet, sufficiently far downstream and without area change, the flow may be assumed to be fully developed, which implies negligible streamwise gradients of all variables, i.e. @ = 0 @n where n is the coordinate direction normal to the outlet. In order to get a mathematically well posed SIMPLEC algorithm, mass flux must be globally conserved . It is a necessary constraint for the pressure correction equation to be consistent. It also increases the convergence rate considerably and has positive effects on open boundaries where inflow is occurring. A velocity increment ; m_ comp out uincr = m_ in(A )out where m _ in is the convection into the domain at the inlet, m_ comp out is the computed convection out of the domain at the outlet and A is the outlet area, is added to the computed velocity at the outlet, i.e. uout = ucomp out + uincr This ensures that global continuity is fulfilled at each iteration. Periodic boundaries can be of two types: translational and rotational. These types of boundary conditions must come in pairs, one boundary connected to another. A rotational transformation of vector quantities is applied on the periodic boundaries. The periodic boundaries may then be treated as though they were connected to each other, since rotational periodicity has no impact on scalar quantities and translational periodicity has no impact on either vector or scalar quantities. 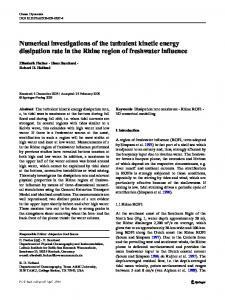 ˚ Hakan Nilsson, Numerical Investigations of Water Turbine Flow in a source term. This smaller problem may be solved by Gaussian elimination, yielding a recursive algorithm that solves the small linear equation system. The convergence of the TDMA is fastest in the main direction. Each linear equation system is thus solved three times for 3D problems, with alternating main directions. The TDMA algorithm is computationally inexpensive and it has the advantage that it requires a minimum amunt of storage. An iteratively converged solution is assumed to be reached when the largest normalized residual of the momentum equations, the continuity equation and the turbulence equations is reduced to 10;3 . The residuals of the momentum equation are normalized by the sum of the mass flow through the turbine and the mass flow through the periodic surfaces multiplied by the largest velocity component in the computational domain. The residual of the continuity equation is normalized by the sum of the mass flow through the turbine and the mass flow through the periodic surfaces. The residuals of the turbulence equations are normalized by the largest residual during the iterations. Figure B.2: The multiblock principle. The blocks have id numbers 1 to 4 and they are arranged in a matrix of lnodes  mnodes blocks. The structured decomposition also allows the blocks to be numbered in a structured way by idl and idm. The numbering of grid-points and nodepoints is also shown. Dashed control volumes are overlapping other control volumes. ˚ Hakan Nilsson, Numerical Investigations of Water Turbine Flow mes close to the inner boundaries thus have neighbors in other blocks. The finite volume method is applied to the control volumes at inner boundaries exactly as though they were an interior control volume. The information in the overlapping control volumes is updated whenever it is needed (see section B.7.1). By using a message passing interface such as PVM (Parallel Virtual Machine) or MPI (Message Passing Interface) the blocks may be distributed to separate CPUs during the computations, which distributes the computational requirements and speeds up the computations (see Paper II). Figure B.2 shows a decomposition of a single block grid that is structured and could have been computed with a single block structured solver. The multiblock principle may also be used to create an unstructured topology, which is a collection of several structured blocks where the global grid is not structured. Unstructured multiblock topologies make it possible to compute the flow in complicated geometries. Figure B.3 shows an example of the complicated unstructured multiblock topology that was used for some of the computations in the present work. The topology is periodic so that the left side can be attached to the right side during the computations. More recent multiblock topologies of the present work are simpler since the ICEM CFD commercial grid generation software has been improved. Figure B.3: A 2D view of a Kaplan runner multiblock topology. The blocks are labeled B1-B12. Some periodic grid points are labeled P1P7. Solid lines are block boundaries. Dashed lines are examples of grid lines inside the blocks. The orientations of the blocks are shown at each block label. The k-direction is common for all blocks. The continuity error, needed for the source term in the pressure correction equation, is calculated from these convections. The inter-block boundary conditions for the pressure correction are exchanged. Inter-block boundary conditions for all variables are exchanged. Other discretized transport equations are solved. The residual is calculated (see appendix B.6) and compared with the convergence criteria. For unsteady computations, the discretized unsteady equations are solved similar to the steady procedure for each time step. The solution at the previous time step is then updated from the newly computed solution, the time is proceeded and the procedure is repeated for the number of time steps that need to be computed. Appendix C PAPERS This appendix contains some of the papers, conference contributions and internal reports that have been produced in the present work. The papers are attached in chronological order since some of the findings in earlier are used in subsequent papers. A Numerical Comparison of Four Operating Conditions in a Kaplan Water Turbine, Focusing on Tip Clearance Flow. Published in the proceedings of the 20th IAHR Symposium, August 6-9, 2000, Charlotte, North Carolina, U.S.A. Parallel Multiblock CFD Computations Applied to Industrial Cases. A Validation of Parallel Multiblock CFD Against the GAMM Francis Water Turbine Runner at Best Efficiency and Off-design Operating Conditions. Internal Report Nr 01/2, Thermo and Fluid Dynamics, Chalmers University of Technology, Gothenburg, 2001. An Experimental Investigation of the Flow in the Spiral Casing and Distributor of the ¨ Holleforsen Kaplan Turbine Model. Internal Report Nr 01/5, Thermo and Fluid Dynamics, Chalmers University of Technology, Gothenburg, 2001. A Numerical Investigation of the Flow in the Wicket Gate and Runner of the ¨ Holleforsen (Turbine 99) Kaplan Turbine Model. Application of a Momentum-Imbalance Method for Investigating Numerical Accuracy in Swirling Flow. Validations and Investigations of the Computed Flow in the GAMM Francis Runner and the ¨ Holleforsen Kaplan Runner. 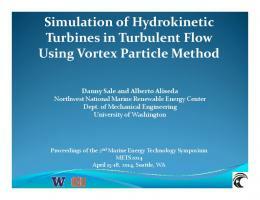 Report "Numerical Investigations of Turbulent Flow in Water Turbines"